Value Yourself: I’ve certainly met with struggles as a young female executive moving up the ranks in corporate America. But, I never rested on my differences from being a male vs. female leader. I knew my value as an individual contributor and leader, separate from my gender. I was also lucky enough to be mentored by very strong men and women in my career. I’ve had the best and the worst of them. The best were those that wanted me to shine above and beyond even themselves. They exhibited such confidence that it was easy for them to share the spotlight and successes. This is something I’ve always tried to model. 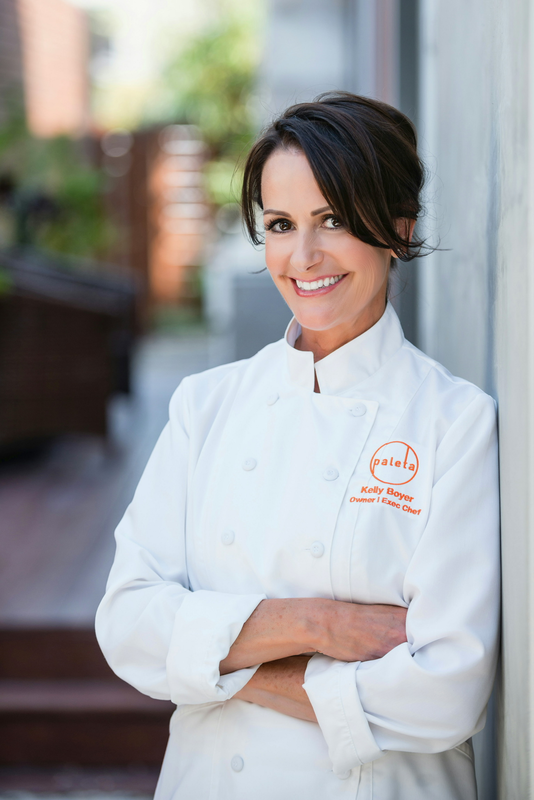 I had the pleasure of interviewing Kelly Boyer, founder and CEO of PALETA Farm-To-Table Meal Delivery and SoCal’s first certified green kitchen. This entrepreneur leveraged a life-threatening cancer diagnosis and applied her love of food and nutrition into a thriving meal and detox business designed to help people change the way the live by changing the way they eat. There were a few factors that built up over time. My cancer diagnosis at age 21 definitely changed the course of my life and how I live it. I’m just a nice Polish girl from the mid-west who was weaned on sausages and fried foods with ranch dressing! The illness changed all that and my entire family began to weave the thread of health and fitness throughout the fabric of all our lives. Once I was healthy, I had a great career in Human Resources after attending grad-school in Chicago at Northwestern/Kellogg. I almost exclusively worked for entrepreneurial companies that were building new brands or starting new divisions or were being built from the ground up. I became passionate about BUILDING things. I ultimately left corporate America to take some time off and ended up enrolling in culinary school for almost two years. I’m a classically French trained chef and became pretty unhealthy after all the cooking with butter and cream. I reverted back to my old healthier ways by adjusting the cooking techniques I learned in school to apply to more healthful recipes. I started learning more about organics and sustainability and then became licensed as a nutritionist to have an even deeper understanding of how and what is best to eat. Because of my own life path, I truly believe that a healthier lifestyle saved my life. I KNOW that what you put into your body really matters. And because of my love of FOOD, I knew I could create CLEAN recipes that put a healthy twist on haute cuisine. Once I started looking and feeling better, friends asked me to help them with their meals so they could achieve their own health and fitness goals. And then it spread word of mouth to their personal trainers, physicians, dietitians, neighbors, family, co-workers … and BOOM! PALETA was born. Launching and operating my business has led to so many personal and professional adventures. I’ve been able to develop relationships with cancer patient clients, celebrity clients, and people from all walks of life whose experiences have completely enriched me. I’ve been featured in magazines, television shows, podcasts, blogs, online publications…you name it. As an introvert, these are not always the easiest things for me, but each experience opens another door to another interesting opportunity. I’ve been able to delve very deeply into my love of clean food by traveling all over the world to witness how the SLOW FOOD movement has crept across the landscape. Truly just helping people become well and continuing to learn more about how to protect our environment through responsible business practices continues to fuel me every day. Perhaps not so much funny as CLUELESS! For me, feeding others has always been a labor of love. A way to say Thank You, to say Happy Birthday, to say I Love You. When I first started PALETA there was a massive disconnect in my brain from turning this mindset into a real revenue generating business. I was so caught up in researching recipes, experimenting with healthy meal options, getting involved in my client’s specific nutrition needs, trying to please them and give them a successful experience….I complete forgot to CHARGE THEM. Hello? After almost three months, yes…3 months, I started sending out invoices and clients were NOT happy to receive those big bills. They had, of course ordered the food and enjoyed it, but it was the simple, basic concept of billing them on time, consistently so the amount due was not so staggering. To this day I am not the woman to “get the check” from the client. I have an accounting team whose sole purpose is to manage the finances, of course, since I recognized early on this was not a strength of mine! PALETA stands out from the competition in a variety of ways. First, all our meal programs are nutritionist designed and highly trained chef prepared. I believe healthy food can taste amazing by utilizing the proper cooking techniques and only using the best possible, clean, fresh, locally sourced ingredients. Our mission is to ensure our clients never feel deprived with our creative conscious cuisine. Further, we know that one size does NOT fit all. There are a myriad of ways to address an individual’s nutrition needs and we have to work with clients to help them identify one of the many food programs we offer to be sure it’s in line with their personal goals. And, that may change over time. Just because a Paleo/GF diet is working for you today does not mean it’s going to be the best diet profile for you as your lifestyle changes. For instance, we offer a PALETA PREGNANCY program obviously specific to expectant Mommies and the food prepared for our Mommy clients changes with each trimester to make sure both Mommy and Baby are adequately nourished during each phase of the pregnancy. An overarching theme for us it be community centric and to be always motivated to be good citizens, even at the expense of the bottom line. We built our GREEN kitchen to LEED specifications and standards and as part of our normal course of business we are always researching new and more efficient ways to protect our planet and mitigate our carbon footprint. Even those extra steps cost money; we believe it’s the right thing to do to preserve Mother Earth for future generations. After a successful KETO KORE detox and meal program launch, I am now embarking upon the development of an anti-inflammatory diet. Our bodies use inflammation to help fight illness and also protect areas from further harm. In most cases, inflammation is a necessary part of the healing process. However, some medical conditions cause faulty inflammatory responses. These are called chronic inflammatory diseases. One of the best measures a person can take to prevent or reduce is to try an anti-inflammatory diet. An anti-inflammatory diet involves eating certain foods and avoiding others in order to minimize the symptoms of chronic inflammatory diseases. An anti-inflammatory diet consists of foods that reduce inflammatory responses. This diet involves replacing sugary, refined foods with whole, nutrient-rich foods, which is already the foundation of all PALETA meal plans. An anti-inflammatory diet also contains increased amounts of antioxidants, which are reactive molecules in food that reduce the number of free radicals. Free radicals are molecules in the body that may damage cells and increase the risk of certain diseases. Research has shown that this diet can reduce the effects of inflammation on the cardiovascular system. Doctors, dietitians, and naturopaths recommend anti-inflammatory diets as a complementary therapy for many conditions that are worsened by chronic inflammation. An anti-inflammatory diet can help many conditions, including psoriasis, asthma, Crohn’s disease, colitis, IBS, diabetes, rheumatoid arthritis, obesity, heart disease, lupus, age-related disease and disorders, and can reduce the risk of certain cancers, including colorectal cancer. While the building block of PALETA food programs is the Mediterranean diet, our new anti-inflammatory/anti-aging meal program is going to take these health benefits to a whole new level. I think this roadmap to leadership is not gender specific and can be applied by anyone to help his or her teams thrive! TRUST AS YOUR GO TO: Let trusting your team to do their best work, following clear direction, be your default. Demonstrating confidence in someone will get the most out of them. KNOW YOUR TEAM’s CAPABILITIES: Don’t put them in a position to fail. Give them the tools to the best job for you. Just because they really WANT to do something, doesn’t mean they’re up for that particular challenge. Knowing what they are good at and where they’ll need help is tantamount to your own success. ENGAGE THE PLAYERS: Just sharing your grand vision alone will not get you desired results Involve the players in goal setting and planning and during the process you’ll be able to identify avoidable roadblocks. CLARITY IS KING: Make sure your team understands WHAT results are important and WHY, WHO the client is, and WHEN something needs to be ready to execute. Generate discussion around this to get their ideas and concerns right off the bat, and you’ll greatly improve their buy-in. CONNECT GOALS TO RESULTS: Ensure you have clearly communicated what the results actually look like. Paint a picture of the goals that are being set and how they are linked to the final picture or product. Assign specific accountability so there is no question about who is supposed to be doing what. CONNECT WITH YOUR PEOPLE: Check in very frequently to assess progress of individuals and progress. This does not have to look like micromanaging. Instead, it can be a show of support and confidence in them. When managing a large team, it’s imperative to ensure that all team members are working toward one common goal, even as that goal shifts and morphs over time. Each player will have differing roles in achieving that common goal, but if they don’t know what it is and how they play a part in overall success, you won’t be able to tap into their individual desire for success, for pride in what they do, for a purpose bigger than the task at hand. It’s easy for day-to-day tasks to take over and become wrote and robotic. In order to ensure ongoing improvements a person wants and needs to see what could lie ahead given the achievement of specified goals. At the end of the day, everyone wants to go home after a hard day at work feeling good about themselves and feeling like they accomplished something. Second only to that is recognizing the good work each individual group plays. You cannot acknowledge good work and results enough. I am forever indebted to my greatest mentor, Mike Frank (currently MikeFrankConsulting.com), during my days at The Walt Disney Company. He was such a strong leader and so supportive of me the very beginning of my young career. He built up my confidence by challenging me to work on really high profile, high-risk projects to showcase my talents and help me build relationships with the executive team at Disney. I’ve never worked so hard with such great and immediate reward. He was patient in encouraging me to do things I was afraid to approach, and he was not shy about feedback, which taught me the value of listening and embracing the coaching of others. He knocked any defensiveness right out of my system by just being forthright and kind and firm at all times. I learned later that he had been struggling with some of his own personal and professional demons at the time I worked for him. I was shocked because he used his own experiences to support and guide the career of a much younger protégé. His selflessness won’t ever be forgotten. I learned from him all about customer service and still hold those tenets to this day. I always want to over-communicate to my clients; I never want them to be surprised or have to ask for follow-up with me about anything. If someone is compelled to ask me for an update or ask for status on something, I view that as a failure on my part. Because of Mike I have become highly driven to provide proactive, thoughtful and useful client service throughout every business I’ve been a part of. I had already had a very successful Human Resources career in multiple start-up companies. All that risk-taking ultimately afforded me financial freedom, so I was able to impart my learning and passions into something that could make the world a better place…one dinner plate at a time! This passion for helping people become healthier was certainly driven by my earlier cancer diagnosis and ultimately remission. My own life was turned around in the most positive of ways after the diagnosis when I changed my eating habits and lifestyle for good. PALETA allowed me to share my experience with my clients in a very hands-on, results oriented way. We help people change their lives by helping them change the way they eat. There is such an onslaught of information on nutrition and health trends for people to sift through and people can get misdirected by choosing DIET PLAN A versus DIET PLAN B to achieve their fitness goals. Because every BODY is different, not all nutrition plans are going to work the same for everyone or achieve the same results. BE PURPOSE DRIVEN: Know what you’re trying to accomplish and why. You don’t need to be perfect in executing your vision, but you do need to follow your true north and be focused and consistent in getting there. I knew that I wanted my company to be very eco-friendly and this has come with some costs. Almost all of our operating costs are more expensive because of this focus; but I wouldn’t sleep well at night knowing that we were being callous about preserving our planet’s resources. Every new initiative requires a scrub test of sorts to make sure we are doing the RIGHT THING. DON’T FEAR FAILURE: Don’t be afraid to fail or make mistakes. Be brazen in your quest for results. Don’t be afraid to make decisions. I made the biggest mistake in my entire career by briefly bringing on a partner after running my business solo for several years. That mistake almost brought my business to its needs because the partner didn’t understand us well enough and had their own ideas of what PALETA should be. It cost us a lot of time and money and honestly shook my confidence to the core. I had a choice, I could either close up shop and go home licking my wounds, or I could build myself back up with the knowledge that I learned a big, painful, expensive lesson and then use that lesson to leverage even greater success going forward. Which, is exactly what I did! ASSERT YOURSELF: Strong, assertive women have historically been marginalized by being classified as DIFFICULT. Thought clouds of the B**** word come to mind. This implies we’re not flexible and won’t back down. I have completely dismissed ‘DIFFICULT’ from my vocabulary. I prefer to think of myself as someone who likes to set the tone and terms of a discussion to make sure my voice gets heard. It does not mean contentious, it means clearly directed. Disagreements can and should be healthy and productive; it’s the only way we can ensure ongoing improvements and growth. You don’t need to walk into a room and act like you own it every time, but clarity of vision and self-assurance are success factors that help lead teams with confidence. SEEK OUT SUPPORT: This was, and is still, a tough lesson for me. I’m very independent in my work habits and am actually pretty introverted as a human being, even though I’m outwardly gregarious and highly animated. I always have to fight my go-to of “I can do this myself…it’ll just be easier.” But, that only gets you so far. You need to seek out people you admire and respect. You need to find people in your industry to share ideas and resources with, and even exchange tough lessons with so we can learn from each other. There is plenty of room for everyone! Why NOT stand on the shoulders of those before us who have paved the way in whatever field we are in. Being an entrepreneur can be lonely and by building a strong network of people around you, you’ll be sure to expand your own thinking and stay ahead of the curve. KINDNESS. I’m not a fatalist or pessimist, but I am saddened sometimes by the lack of pure and simple kindness in the world. I know it exists, but so many of us are so caught up in the fast current of day to day living that we can easily neglect the needs and sometimes even the very existence of others. Simple smiles when you pass someone on the sidewalk, a polite Hello and Thank You at the checkout counter, or not averting your eyes when you see someone in need. We all have countless ways throughout the day to be kind to others and if it got added to our never-ending to-do lists, the energy change around us would be palpable. “We cannot solve our problems with the same thinking we used when we created them.” ALBERT EINSTEIN I love this quote because I know and experience every day that change is constant. Because most things are always evolving (our businesses, our families, our friends, our selves), so does our perspective change and evolve. How we make decisions needs to change as we learn and grow. The same rules and structure I set up for my business when I launched it eventually did not meet the new needs of the business. Clientele profiles had shifted, service offerings expanded, competition began to nip at our heels, so how I did just about everything had to change and grow to meet the transitioning needs of PALETA. It reminds to be nimble and never get stuck in a rut of just doing something because that’s how we always did it. Sheryl Sandberg is really a source of inspiration to me these days. While I don’t agree with everything she espouses, there is a lot that I really embrace and agree with based on my own personal experiences. She acknowledges the challenges of career versus motherhood and says Dads need to parent more. She really recognizes and lauds the activists/feminists before us and knows that we stand on their shoulders. She reminds us that men still rule the world and make more money…hopefully not for too long now. She makes women take a hard look at themselves to see what internal struggles or demons hold us back. Her work generates a lot of thought and conversation. After reading her book LEAN IN, I bought copies for almost a dozen young women I know just starting to make their way in their careers. I’d love to sit across the table from her for a very long meal.